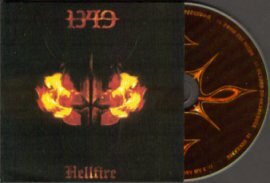 Unlike most of today's black metal acts, 1349 showcase their expression of music in way that is loyal to it's true meaning; 1349 put aggression before emotion, audio brutality ahead of melody, thus holding to those wanton standards that were utterly set by their local infamous paragons of the mid nineties. Do not get me wrong, this doesn't bring 1439 into a wave of mediocrity but are far from being just another black metal band from Norway. Being loyal to their predecessors and remaining true to the satanic movement is represented with their album Hellfire in a worthy and admirable way. Supposedly the albums of Darkthrone represent the black metal totality for you and the most aggressive parts of Gorgoroth or Satyricon bring the most violent and blasphemous imagery to your mind. Well, Hellfire is violence and death musically incarnated. Blistering aggression and ruthless guitar ripping combined with painful vocals from the very first second of the album to the last. Speaking of vocals, 1349's Ravn really doesn't represent a typical black metal vocalist. Hateful shouting and highly distorted shrieking brings an innovative vocal atmosphere, a step further in development from what one might heard in another black metal classic, Zyklon-B's Blood must be shed. This is absolute black metal, without ear-friendly compromise. Relentless musical annihilation without catchy melodic parts or soft keyboard passages. Except for a few thrashy elements within the tracks, this is a true black metal album. What really puts a listener into the right mood is the production of this album. Being totally raw and unpolished it makes it a convincing black metal creation. Still, I haven't mentioned the fact that truly puts this band on the throne of it's own. It is speed! As far as I know this is the fastest piece of music Norway has ever offered. Endless blastbeat aggression, ultra fast snare hitting, constant changing tempos and diversity are qualities handled by a single man machine - Frost. An addition of Satyricon fame puts it's mark on this band. Either way you look at it, it's good to notice this as in my opinion this is absolutely the most aggressive and fast performance Frost has ever been a part of. This is without a doubt one of the best extreme and true black metal releases in a long, long time. An album that outshines all those representatives of extreme music with it's raw production and demonic musical drive. If you're in a mood of extreme and primitive aggression, you might enjoy the fact this album is offering you just that and nothing less for 52 minutes.